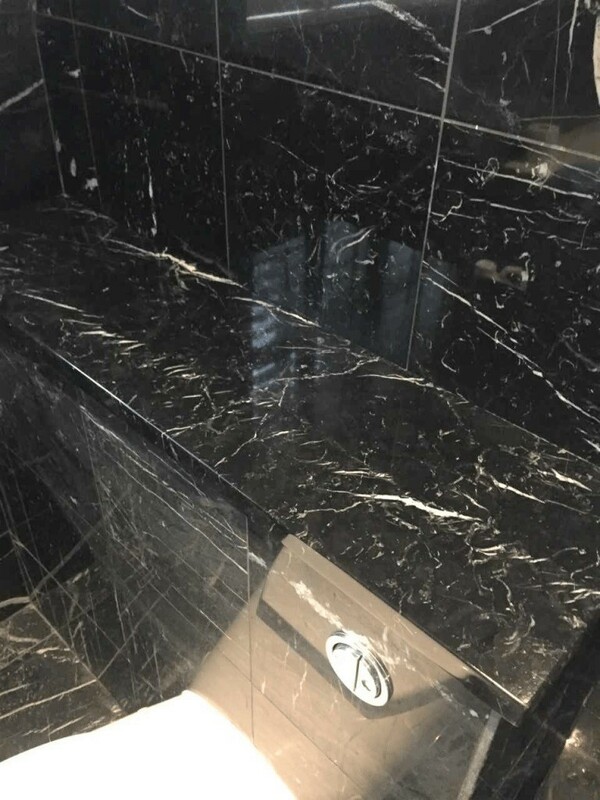 We were asked to visit a property in Cambourne to look at restoring the appearance of the stone in an opulent marble tiled bathroom. Cambourne is a new area of Cambridge which has been developed over recent years with the creation of many new homes. The gorgeous bathroom design and layout of this home was was a key feature of the property. The owner had employed a general cleaner to give their house a spring clean. Unfortunately, they had used inappropriate products whilst under taking the clean of the marble tiles in the bathroom which ruined its appearance. 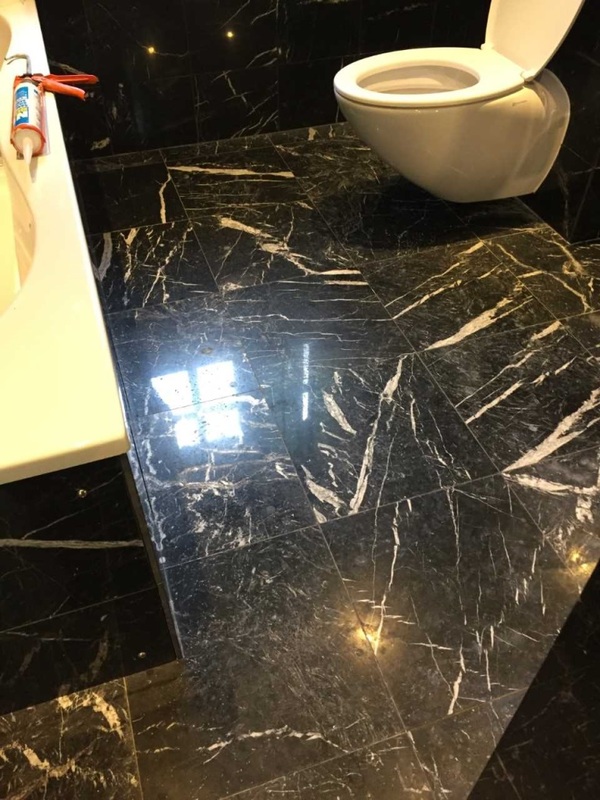 This is an easy mistake to make, people are often unaware that polished stone such as this should only be treated with specialist products. Many household cleaning products are too strong to be used on natural stone and can cause damage, so always read the label. 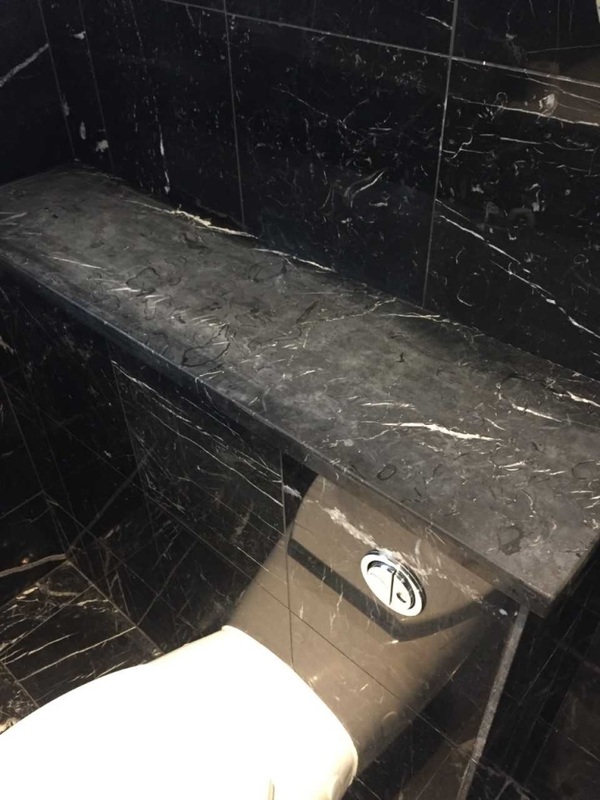 As you can see from the pictures, the products the cleaner used etched the surface of the marble ruining the polished appearance and they were at a loss to restore it. I wasn’t surprised to find that they couldn’t restore the polished appearance of the Marble, as a hard stone needs to be burnished to build up a polish. I suspected that the product the cleaner used on the stone much of been acid based as only an acidic product would have had this effect on the stone. To restore the polished appearance of the Marble I used a set of six-inch diamond encrusted burnishing pads which come in 400, 800, 1500 and 3000 grit and are applied to the stone with a hand-held buffer. Starting with the coarse 400-grit pad I worked up through the series of pads gradually building up the polish; water was used to lubricate the polishing process and I rinsed the tiles in between with more water to remove the soil generated and used a wet vacuum to remove the resultant soil. Normally I use this process to burnish stone floor tiles using much larger pads fitted to a floor buffer but within the restricted space of a bathroom this isn’t practical and so it did take some time to polish all the Marble tiles. Once the stone had dried, we applied a couple coats of Tile Doctor Colour Grow which is a colour intensifying impregnating sealer that will provide durable protection going forward making it very easy to clean. One litre covers approximately 15m² to 20 m² (150 to 210 sq. ft.) so a small amount goes a long way. 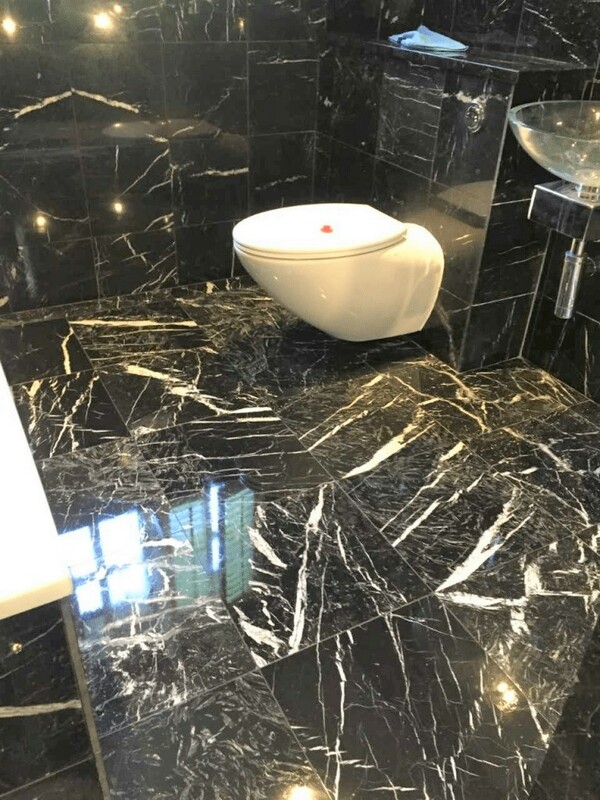 Once complete the natural features of the marble really stood out and the bathroom looked stunning, certainly our client was over the moon with the results and much relieved the damage caused by the cleaner was resolved. To avoid further issues during cleaning we recommended the client use Tile Doctor Stone Soap going forward. This product has been specially formulated for the regular cleaning of polished stone, it helps build patina and will keep it fresh. The client was so satisfied with our work they asked us back to complete a deep clean of the patio.